"Very easy sour cream pie that tastes very much like cheesecake. Use your favorite type of fruit pie filling on top, and garnish with whipped topping if you like. You can even use low-fat ingredients to lighten it up." In a large bowl, mix together sour cream, sugar, salt, and flour. Add eggs and vanilla; stir until thoroughly combined. Pour mixture into graham cracker crust. Bake in preheated oven for 40 to 45 minutes, until firm. Spoon pie filling over top immediately. Allow to cool slightly, then refrigerate at least 4 hours before serving. The adults in our group LOVED the pie. It does remind you of cheesecake, only lighter. Half of the kids liked it and half thought it was too tangy. We decided it was a "keeper!" This was good, but I expected something a bit more flavorful. This pie is very good with an undescribable taste. It was very easy and I will make it again. This is a great quick summer pie. 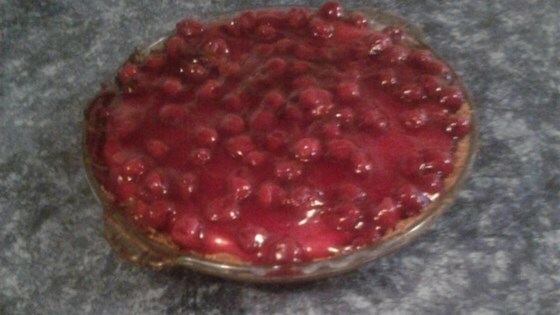 I used low fat sour cream and lite cherry pie filling, it tasted great. The whole family loved it. Quick and easy, I love this recipe. It reminds me of a light cheesecake that doesn't give you that heavy sensation of eating a brick of cream cheese.